Tim May with his 1916 Gibson K4. Photo credit: Dan Miller. Never pass up the chance to catch a world class musician in action. That's always been my rule and this summer I found myself at a mandolin and guitar workshop hosted by Tim May and his musical partner Dan Miller, the founder and editor of Flatpicking Guitar Magazine. Dan and I had crossed paths a few times over the years. Tim I knew only by his reputation as a top-flight Nashville musician and the popular YouTube videos of vintage Gibson instruments he made with David Harvey. Before a packed house at Mass. Street Music in Lawrence, Kansas, Tim and Dan led a group of students of all levels through a hands-on workshop that took the complex subject of improvisation and presented it in a manner everyone understood. In the crowded world of stringed instrument workshops, few can pull off what I witnessed — everyone went home with something they understood and could use to move forward. Impressive. When Dan mentioned the two would embark on a workshop and performance schedule in the Fall I called upon him for a feature interview with Tim about his music career and vintage Gibson collection. Together they're one of the finest total workshop packages I've witnessed. Starting next month they're touring east and west and points in between. What I saw in person that evening I'd like my fellow mandolin and guitar brethren to experience as well. Check out their schedule at the end of this article and don't miss them when they're in your area. Whether it's a workshop, a performance or both, you won't be sorry. Tim May performing his composition Winds of Capri on a recording by the band Plaidgrass. On the recording Tim used his Gibson 1917 H2 mandola. In the world of acoustic music, Nashville's Tim May truly is a renaissance man. Known to many bluegrass and newgrass fans as the guitar player, singer, and songwriter for the band Crucial Smith, Tim's interests, talents, and expertise range far beyond the role he played for the fifteen years Crucial Smith stayed together. 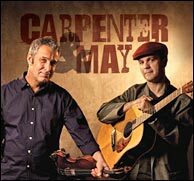 Carpenter and May, released October 1, 2011. He's a highly sought after instrument repairman, a talented instrument builder, a vintage instrument collector, an instrumentalist who has been in the company of some of Nashville's biggest stars both in the studio and on the road, a published author, and a popular guitar and mandolin instructor. 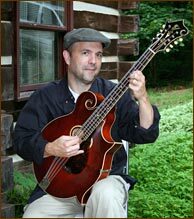 While it is Tim's fine collection of vintage Gibson instruments that will be of greatest interest to Mandolin Cafe readers, let's first mention a bit about his background so you get a chance to know him before we talk about the Gibson collection. Born in Texas and raised in Mississippi, Tim moved to Nashville in the mid-1980s to attend college at David Lipscomb University. While there he performed in a touring band that recruited for the school. He and another member of the Lipscomb band, Kyle Wood, eventually started the band Crucial Smith outside of what they were doing for the school. 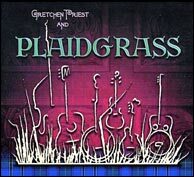 Gretchen Priest and Plaidgrass, from 2008. Crucial Smith, who was produced by Newgrass Revival's Pat Flynn, stayed together for fifteen years. During that time they recorded several CDs and toured the country playing at many of the larger bluegrass festivals. While performing in that band Tim's reputation around Nashville as a talented singer, songwriter, and multi-instrumentalist grew. So, when the band broke up in 2002, Tim's phone started ringing. Since moving to Nashville, Tim has shared the stage with many of Nashville's talented musicians and participated in too many recording sessions to count. Some of the highlights include touring with Patty Loveless (performing on guitar, mandolin, banjo, and Dobro), touring with Eddie Rabbitt, touring with John Cowan, recording with Charlie Daniels, performing on the Grand Ole Opry dozens of times with Mike Snider, and recording and performing with the Moody Blues as a member of the Moodybluegrass band. Currently Tim performs on guitar in a trio with fiddler Fred Carpenter and bassist Charlie Chadwick. Their CD, titled Carpenter and May, reached number one on the folk radio charts in September 2010. Gretchen Priest, fiddle; Tom Saffell, banjo; Dan Miller, bass; Tim May, mandocello. The band performs a medley of two jigs going into a reel: Banish Misfortune/Blarney Pilgrim/Waiting for the Federals. He also performs in a band with his wife, Gretchen Priest-May, called Plaidgrass. A third group Tim performs with is the trio of Davis Miller May. In this group Tim plays mandolin, guitar, banjo, and Dobro, Brad Davis plays guitar, and Dan Miller plays bass. This group has just recently released their first CD, titled Doves, Buzzards, and Crows. As if those three groups weren't enough, Tim also performs in a group called Radiola with Dave Harvey, Brian Christianson, and Jon Weisberger. When he is not performing on the road or recording in the studio, Tim is either building or repairing instruments out of his home just west of Nashville, or he is touring the country with Dan Miller teaching guitar and mandolin workshops. He also teaches at a number of popular music camps around the country each year. 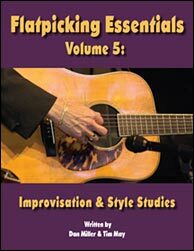 Tim and Dan Miller have co-authored a very popular eight-volume instructional course for flatpicking guitar players called Flatpicking Essentials. They've also produced three instructional videos. The first focuses on improving speed, accuracy and tone. The second teaches how to create solos by learning to embellish the melody of any tune. The third presents an approach to learning how to improvise. When asked what inspired him to build this collection, Tim said, "A friend, Rick Osborn, in Los Angeles who had a 1919 L4 guitar. The guitar had been sitting in its case at Rick's house for years and he felt like it needed to be played. So, he gave me the guitar." Rick's generous offer inspired Tim to think about owning more vintage Gibson instruments. Tim said, "I had played Gibson mandolins and banjos for years and I had always liked the warm quality of their oval hole instruments. So, I thought it would be nice to build a collection of those instruments. I focused on instruments that were built in the teens, mostly because they had the inlaid Handel tuners (which were discontinued around 1919). Also, I couldn't afford Loar era instruments. Then, to narrow that focus even more, I decided that I'd focus on instruments that were available with a sunburst finish. That narrowed the group of possible instruments to twelve." Shortly after receiving the L4 guitar, Tim bought a 1917 F2 mandolin from Fred Carpenter at The Violin Shop in Nashville. With his first two instruments in hand, he then started collecting in earnest. Over the course of four years he eventually collected all twelve instruments. The sunburst mandobass was the hardest to come by and the K4 mandocello is the rarest and most valuable of the bunch. Some of the initial instruments that he bought were later "traded up" when Tim found instruments that were in better shape than the ones that he initially had in his collection. All of the instruments that he now owns have all original parts (although a few have had the frets replaced). All instruments are accompanied by their original cases. For purposes of playability, Tim has replaced all of the original bridges with adjustable bridges, but he hangs on to the original non-adjustable bridges. Tim said, "When I was searching for instruments, originality was a big deal for me." When asked what it was about this group of instruments that caused him to focus on collecting them, Tim said that he wanted to have a collection that highlighted the pre-Loar Gibson instruments. He said, "Lloyd Loar developed a modern sound by developing the f-hole instruments, adding the truss rod, and raising the fingerboard off of the top of the instrument. His instruments had more power and projection than the oval hole instruments and they are great. However, the oval hole instruments have their own unique positive qualities. They have a warm tone that I love, and the craftsmanship before Loar was every bit as good. Gibson made great instruments before Loar arrived. The craftsman who were there before him set the stage for everything that he achieved." 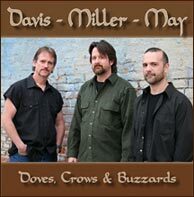 Doves, Crows & Buzzards - Davis Miller May. Although today the Lloyd Loar instruments are the most valuable and the most sought after, Gibson's real golden era in terms of sales occurred before Loar joined the company. During the early part of the century (from the late 1800s through 1918) mandolin orchestras were thriving. However, their popularity started to go into decline after World War I (1918). During the mid-to-late teens Gibson was selling a strong number of instruments per year. By 1922 those numbers had fallen. During 1923 and 1924, Loar's time, sales rose slightly. However, by 1926 Gibson was building fewer instruments a year and the numbers remained low through the depression. So, the instruments in Tim's collection represent those that were made during the peak of sales, and the peak of interest in the mandolin family, during the first half of the twentieth century. Incidentally, Orville Gibson died in 1918 so he never saw any of the f-hole instruments that featured a truss rod and an adjustable bridge. Although many instrument collectors buy instruments and let them sit in their cases for months, or years, without playing them, Tim makes an attempt to keep all of his instruments busy. He inspects them on a regular basis and spends time playing them whenever he takes them out of the case. He also uses them on stage and in the studio. In June 2007 Tim and Dave Harvey both brought their Gibson collections to the Country Music Hall of Fame and gave a one hour presentation where they played the instruments and talked about their history (see below). Tim May and Dan Miller will be touring the U.S. teaching 24 workshops across 11 states in October and November 2011. The topic of their workshop is "Improvisation for Guitar and Mandolin." Their complete workshop schedule can be found at Flatpicking Magazine. Part 5 of a series of eight YouTube videos where Tim May and Dave Harvey talk about and perform on their vintage Gibson collections during a visit to the Country Music Hall of Fame. That's my old K2 mandocello. I sold it to David Harvey. Good to see it getting played again. It languished in my closet for many years after my Irish music days back in the 80s. I went to one of their guitar workshops last year. Very well put together and informative. I talked mandolins with Tim for quite awhile after it was over. That's one heckuva nice collection. And man can he play the mandocello! Awe man, you guys were just here in No VA? Sorry I missed your workshop, come on back! Love the Plaidgrass YouTube video. Great playing and that 8 string banjo sounds fantastic as does the whole band. Noting the anniversary of this interview filled with tremendous vintage Gibson eye candy! And the collection is now at The Metropolitan Museum in N.Y.C. . . . . . .